Two big stories emerged from Columbus late Friday that have gotten plenty of ink but precious little critical analysis. The good news story is that Columbus Crew SC looks set to stay put, thanks to the emergence of local buyers after a year-long grass roots campaign by supporters to keep the team. 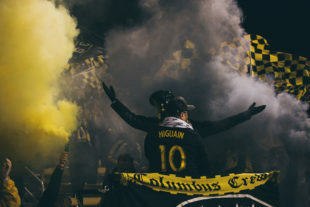 Current Columbus owner Anthony Precourt looks set to be rewarded for his underhanded dealings by getting a discounted expansion MLS franchise in a city with limited demonstrable demand for the club and a state that inadequately supports its two other MLS teams. Precourt’s PSV bought Columbus for $68 million in 2013, well more than it was believed to be worth, secretly planning to move the club to Austin from the get-go. In comparison, the most recent MLS expansion club, FC Cincinnati, was charged a $150 million expansion fee. Basically, Precourt gets an $82 million discount and circumvents the whole expansion application process. On top of that, Precourt looks set to reap some of the sale price of the Crew franchise to the new owners. Yes, really. It’s the best bit of business that Precourt has done. Everything else has been cynical and at the fans’ expense, from Crew SC’s awful television deal to the lack of local advertising about the team, devaluing a club that had legitimate challenges that could have been addressed already. As in the classic baseball movie, Major League, set in nearby Cleveland, Precourt clearly sought to drive the product downward to justify a move to Austin. And let’s be clear: Fans support this club when the club supports them. 11,000+ season tickets have been pledged in our Project 2019 drive. All from people committed to new local ownership. All willing and eager to support the team in 2019 and beyond. Build a proper downtown stadium, like other clubs have, not an outdated erector set with exploding scoreboards, and fans will come out. Separate lawsuits in Texas and Ohio to stop the move. Austin has failed to sustain a USL club in the past, and while it might succeed with a new club under the right circumstances, there’s no evidence the city will adequately support an MLS side. The league’s two Texas clubs are among MLS’s worst in attendance. Austin would be the league’s only city without another major league sports franchise to demonstrate viability of pro sports. The reaction in Austin to the club has been fairly muted, to say the least. Then we come to Precourt and his Precourt Sports Ventures, who have looked like amateurs when it comes to Austin. Have you seen how Precourt has stumbled through everything about the Austin move, beginning with revealing the plan shortly before the playoffs began last year? Have you seen the awful Austin FC logo, which looks like it was curbed from Google Images? It’s been a pathetic exercise, a black mark on the entire league that never should have struck its agreement with this clownish scofflaw son of a Texas oilman. No team in MLS history has ever truly and fully lost its club to another city. (The original San Jose Earthquakes moved to Houston but were reincarnated as an expansion club.) This shouldn’t have happened. Nor should Austin FC under Precourt. If Austin earns a club on its merits, more power to those fans. It’s a trendy city. You can see why Precourt would enjoy being an important person there. But does Texas really need another club after insufficiently supporting the current ones? As MLS sorts out the sale of Columbus Crew’s rights to local ownership, league officials should try to extricate themselves from dealings with Precourt. The league has enough issues to address with legacy franchises without needing to solve new ones that a problem child like Precourt will raise in Austin. Author’s note: For more on this topic, click here. It’s worth reading. I remember when Precourt first took over the Crew and there was a lot of fanfare about investment and even the rebranding to Crew SC was a good move… but this guy is snake. Unreal that the league is going to let him bring a team to Austin when basically ALL the other competitive bids probably scored better against the criteria. He should be memorialized as a villain of professional soccer. Same thing happened here in Chicago. In 2020 it will be renamed to Hauptman Wooden Spoon Award. Wouldn’t promotion and relegation go a long way to solve this issue by making entre to the first division based on merit — from both a sporting side and business side — instead of a purely financial one? This should be really embarrassing for MLS from all sides for allowing it to almost take place. That’s all. We are getting closer to a tipping point where pro/rel makes sense, but MLS is the way it because the financial interest wasn’t there. We are still 20-50 millionaires short of getting a full system set up, but USL is setting the foundations of the pyramid. I have no doubts that MLS will be a part of it at some point. We already have a striation of owners (cough, Sugarman v Blank, cough) and it will only be a matter of time until you get enough of them fed up with the guys pretending to run a team. course quite a few of those millionaires are already investing in open leagues abroad… because buy into a Tier II or Tier III struggling club—is quite inexpensive ….relative. Not to mention some of the grandest clubs in all the world are already owned by american holders. In other words there is plenty of money and plenty of interest now. Just have to loosen the cord a bit. Full marks to Silver Rey for noticing that USL May start practicing Pro/Rel a few years down the road. The Soccer Don absolutely pulled some mafia level maneuvers to strong arm Columbus into paying for Precourt’s move. It’s going to be very interesting to see what the final numbers end up at and who gets what. I definitely think Precourt will get something (booooo) to cover the fact that he loses the team and will have to start from scratch with the FO – although I doubt that the majority of them were going to go with him to begin with. That’s probably at least $20mil right there. The Don will be happy because he will most likely get his $150mil extortion fee for having another team enter MLS. Though he won’t be happy that he lost the battle against Columbus and they will now be his boss (in name only unfortunately, as we all know he holds the real power). One can only hope that he is worn out from reading all the negative tweets from the last year and decides to retire when his contract runs out this year. Poor San Antonio definitely loses out in all of this and I sincerely hope that they find a way to get their lawsuit against MLS back on the dockets. They’ve lost $20mil+ at the behest of MLS plus the $5mil application fee (was this returned to them?) already on top of losing out at the chance of getting a team. I honestly feel bad for Austin fans – I’m not sure it’s possible to start a team in a worse way. On top of that Precourt is not known for the ability to build. He was given the team by Garber, he was given Berhalter by Garber, he was given the biggest sponsors (ironic considering he was actively NOT looking for them), and he already had a stadium and FO set up. Now he’s going to have to do all of that by himself, with his personally picked staff of Dave Greeley (who infamously worked to kick the Fire out of Soldier Field before he went to work for them and began their downward spiral they find themselves in now) and Andy Loughnane who has spent the last 3yrs in an environment of lies and deceit. Don is getting an extension. You didn’t hear it from me. Look at this transaction from the MLS standpoint. They get an additional $150 million from deep pocketed new owners in Columbus and maybe a new SSS stadium downtown(so maybe they throw a small portion of that $150 million at Precourt to go away (ie move to Austin)) Precourt goes to Austin to do what he is going to do. If he succeeds, MLS wins. If he fails, MLS is not going to give him his $68 million back. If he sort of fails and he sells Austin to better owners at a premium, he makes some money but MLS is rid of him with better owners in Austin. And MLS does not look like the bad guys in moving a team out of Columbus. Yes, Precourt is a villain. But he is proving to be a pretty dumb villain as the last year has proved with all the lame actions he has undertaken. The smart guys in the room (the other owners) have taken him to the cleaners in a sense. Well now…this is pretty well argued. Love good arguers. By the way, thanks for all of your writing on this matter Dan. Articles like this definitely played a part in shaming MLS into doing the right thing. I hope so. I hope that continues. This is the antithesis of what many of us love about MLS. A lot of these ideas have been banging around in the dark recesses of the back of my mind. Thanks for putting words to them. I’m incredibly happy for the fans in Columbus. But I’m ready to vomit at just how much the slimeball Precourt comes out ahead in this deal. The hole in the argument here, as Jack alludes to above, is that if Austin FC fails, the one who loses all that money bringing a team to a city that can’t support one is… Precourt himself. Plus, if they do fail, and the team gets sold, no reason why some crafty local-ish owners couldn’t simply move it to San Antonio. Which is only ~70 miles from Austin. So even the Austin fans could continue to come see them. Also, I think it’s quite likely that Garber was caught unawares by the magnitude of the PR hit to the league from this proposed move. But by then he had probably already made promises to Precourt in writing. So, while it looks like Precourt is getting a good deal for a franchise, cutting a deal with him was probably the best way they could simultaneously meet their obligations to him and satisfy Crew fans who want to keep the team. Sigh….eyes rolling emoji. Two more teams coming into MLS by 2022 only to risk being relegated…. into USL which has an affiliation with MLS. CBA for MLS players which is negotiated with MLS players association and is up in 2020 and USL has no Union for players. New T.V.contract in 2022 as the old one runs out and owner’s who are tired of cheap owners want to reward a USL team with an owner who might have even less money….or better yet like the Cosmos who were losing money with hopes of forcing their way into MLS. Laughing crying emoji…pro/rel is on the way. The money Man is a Knoxville business man with a Cleveland NFL team and brother of the governor of Tennessee. Local he is not ! The pudding is in the details. If Precourt hadn’t come along , no telling where this team would have ended up years ago. That’s not entirely accurate. Haslam will be a part owner, as will the Columbus Partnership, and a Columbus-based family. Haslam himself owns an Ohio team which he’s poured a whole lot of money into to try and turn around. And the whole “where would they be without precourt” thing is just dumb. The first franchise in MLS history made it just fine for 20 years without precourt, and he’s done nothing but sabotage the organization at every turn since he bought them. Where would the crew be if precourt hadn’t come along? In a whole hell of alot better position, that’s where. I’m not sure what your problem or contention is here.